Pipe drainage fall rates – without a correct gradient the water in the pipe may not flow. Access ramps – standards are very strict on things like disability ramps. Stairs – like access ramps, stairs are a very important element to get right in terms of gradient/slope design. In this blog article I will be showing you how to calculate the gradient by hand which will be useful for sites where you don’t have a calculator. We also have a calculator for each section making the process even easier. A gradient is a complicated word for quite a simple concept. 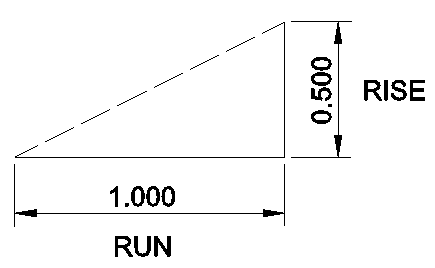 The gradient refers to the change rate of a slope. Take for instance a gradient of slope that is 1 in 40 (1:40). A 1:40 slope means that for every 40 metres along the ground, the slope height increases by 1 metre. A 1:0.5 slope means that for every 1 metre along the ground, the slope height increases by 0.5 metres. A gradient can be expressed in 2 ways, a number or a ratio. For instance a 1:40 gradient number is shown as 0.025 (example shown in calculation section). The following sketch should help. Step 1: Work out the run length. This is the horizontal distance along the ground. Example number 60 metres. Step 2: Work out the rise length. This is the vertical length going up. Example number 12 metres. Step 3: Divide the rise length by the run length, in a calculator this would be 12 ÷ 60 . This would equal a gradient of 0.2. Rainwater drains at 75 & 100 mm should be laid at ratios of 1:100 or less. Rainwater drains at 150 mm should be laid at ratios of 1:150 or less. Rainwater drains at 225 mm should be laid at ratios of 1:225 or less. Flows Less Than 1 litre per second (pipes not exceeding DN100) – should be laid at ratios of 1:40 or less. Flows More Than 1 litre per second (pipes not exceeding DN100) – should be laid at ratios of 1:80 or less with at least 1 toilet connected to it. DN150 pipe – should be laid at ratios of 1:150 or less with at least 5 toilets connected to it. Hopefully this explains what a gradient is and how it is calculated. If you have any questions or queries I can help with then please let me know in the comments section. Happy to assist!